Straight Sales offer long-term stability. The offers don’t go down easily, so you can build your business around them. You don’t have to worry about chargebacks or high-risk MIDs. Cap is unlimited. Straight Sales are the future of Nutra! There’s good reason for this: it’s all true. However, that’s only half the story. These are all valid points as well. Do you see the problem here? Straight Sales have immense promise - imagine receiving a huge payout and calmly depositing it without worrying about chargebacks - but they’re not easy to enter, and the upside doesn’t always seem as reachable at first glance. Truth is, we’ve been working on Straight Sales for years. We’ve seen the problems - but also the potential. We spoke with our top affiliates and asked them about their struggles. We spoke with our advertisers to aggregate their stories and find patterns. We looked at everything we have at our disposal and thought hard about how we could leverage our assets to help you, our affiliate partners, crack the Straight Sale code and turn those dreamy promises of steady stress-free profits into your new bread and butter. Now, after significant testing and reviewing feedback, we’re positioned to help you scale Straight Sales quickly and effectively - with full support to minimize and/or overcome your biggest frustrations and setbacks. It may be true that Trials will never go away (they're the low-hanging fruit of the industry), but Straight Sales are on the rise. We’ve figured out how to make them work, and we’re ready to back you through the transition - and yes, that means Net 0 payments are possible. Who are Advidi Straight Sale offers for? You’re already strong in a vertical that makes direct sales (such as Ecommerce) and want to earn more money through long-term affiliate commissions. Yes, you read that right… these aren’t necessarily the best offers for brand-new affiliates. Once you get an offer going, you can continue milking it without fear of suddenly having to start all over again. Need we say more? Forget sitting around with your fingers crossed for 2-3 weeks. With no retention reports to deal with, you don’t have to worry about potential deductions from your next wire. With no retention reports and offers with exceptional longevity, it’s clear that an investment in Straight Sale traffic has significantly higher value than that in Trials or even many other affiliate marketing verticals. Cracking the code means long-term profits (if you haven’t already - and we can help you if you match the criteria above). Because the sale is made right away, you get data right away - allowing you to optimize and scale faster. 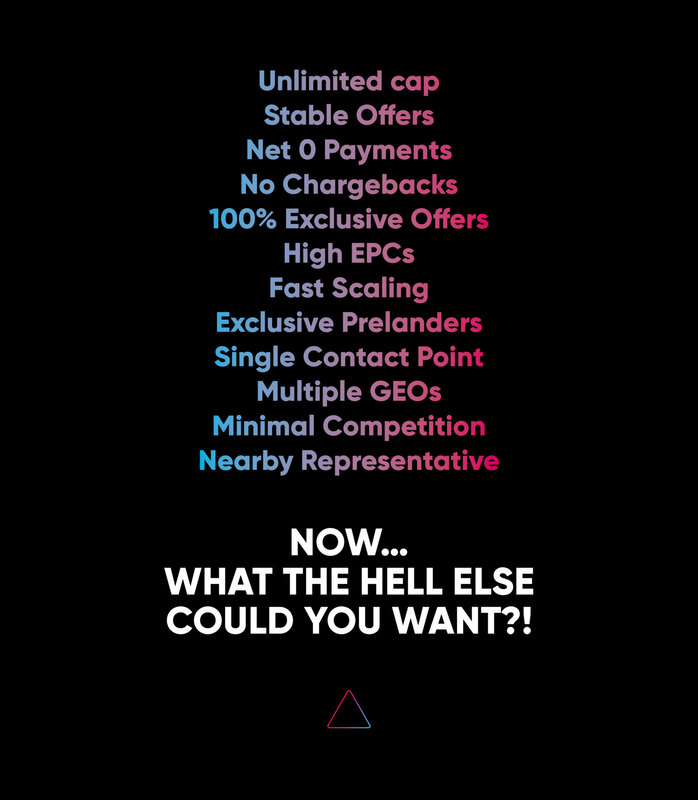 Rapid cashflow, unlimited cap, long-term business potential, high EPCs, stable offers, fast feedback and no retention reports to worry about. Perhaps… one place to find the absolute best offers? You cannot find these offers anywhere else - no matter how hard you try. 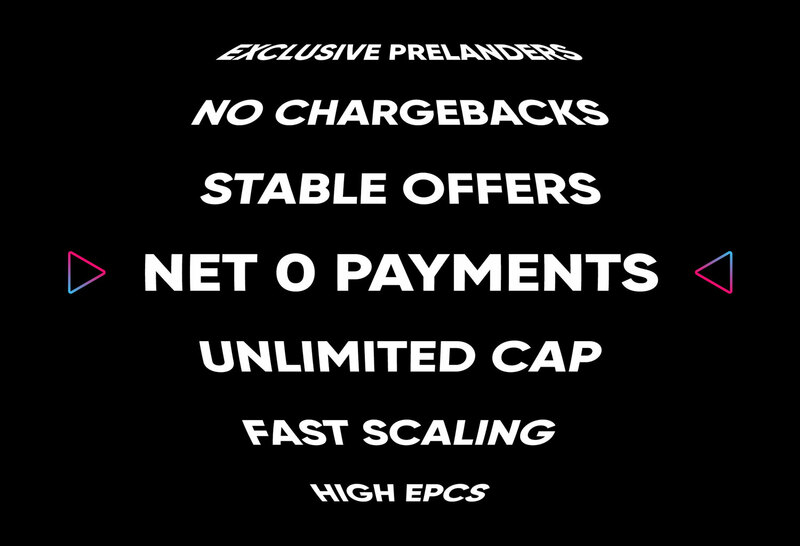 If your quality is high, the competition is extremely low, leading to near-endless scaling potential (and these offers won’t get saturated any time soon). 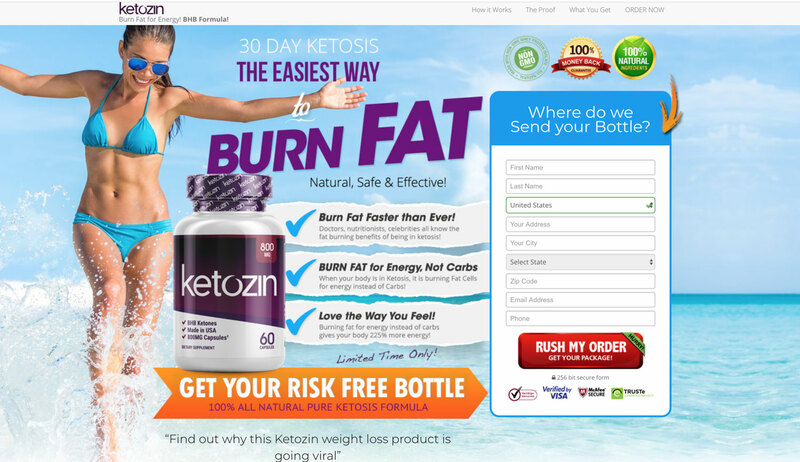 A few of our highlighted exclusives include Ketozin (Diet), Forskolin (Diet), and Beautcy (Skin). Male Enhancement and CBD offers are coming soon as well! Our in-house design team has created a portal full of high-converting prelanders for you to use right away, including many directly from the advertiser. You can easily choose from a wide selection and request custom edits according to your needs. Because there’s no need to wait around for rebills or chargebacks, we’re able to speed up our payment cycle even faster than before. In some cases, we can even offer Net 0 payments (ask your AM for details). Working with us is like having a direct relationship with dozens of advertisers, all on one invoice and with a single point of communication. This frees you up to focus on what you do best: make sales! When you run Advidi Straight Sale offers, you get a whole world of opportunity - we’ve got offers in numerous GEOs and niches, allowing you to quickly test and find winners easily. Why keep this all to yourself? With unlimited cap, there’s no reason - and with our Referral Commission Scheme, you can earn bonus profits on everyone you sign up. It only takes a moment to refer someone, and you’ll earn hands-free commission for a full year. Thanks to our new office in Puerto Rico (with Stephen Lucas at the helm), we’re more present than ever - allowing us to schedule meetings and develop close working relationships that pay off huge in the long run. Ok… maybe a tangible roadmap that you can follow to achieve success? With help from our partners, we’ve solved a lot of the problems with Straight Sales - and we’re ready to use our knowledge and resources to help you find success as well. 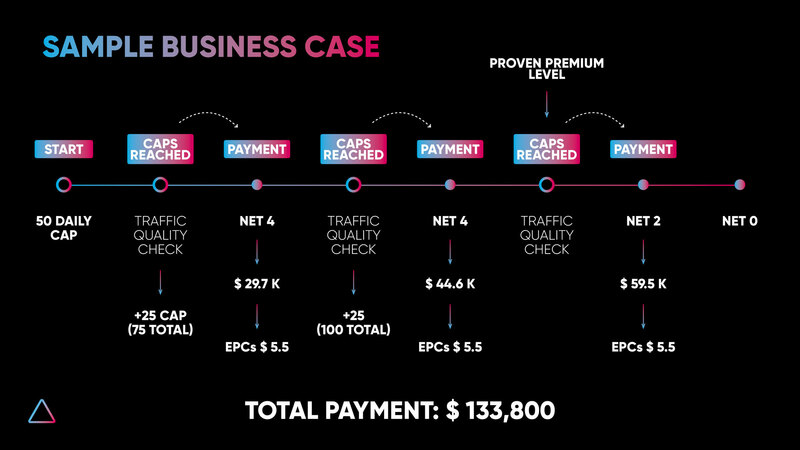 As a new Straight Sale affiliate, here is a sample path you will take to achieving rapid cashflow, steady conversions and long-term rewards. Please note that these numbers are based based on current averages for the Ketozin Straight Sale offer - yours could be higher or lower depending on which offers you're running, but this is a good middle ground for what you can expect. You start with 50 daily cap. Filling that will result in a $29.7k payout after one week. We quickly check traffic quality. When that's approved, we pay you $29.7k on Net 4. You also get an additional +25 cap, reaching 75 daily cap. You fill that 75 daily cap for a $44.6k payout. We check traffic quality again. When that's approved, we pay you $44.6k on Net 4. You get +25 cap, reaching 100 daily cap. You fill that cap for a $59.5k payout. We check traffic quality again. When that's approved, we pay you $59.5k on Net 2. At this point, we’ve paid you $133.8k and you are now at the proven premium level. You get Net 2 payments with the possibility to move to Net 0 payments and unlimited cap. Beat the rush - NOW is the time to get a head start! As we all know, the “Nutra Boost” hits in January, when traffic costs are lower and consumers are looking for some extra help with their New Year’s resolutions. By getting started on the Straight Sale path right now, you'll be in a powerful position come early next year - with enough cap and cash to reach record numbers. While other affiliates are busy fighting over limited Trial cap, running into cashflow problems at critical moments and struggling to find offers… you’ll be sitting pretty with massive daily income. If you’re already a member of Advidi, ask your AM about Straight Sales. They’ll give you the latest, plus access to our design portal and any other information you need. If you haven’t signed up to Advidi, do so here. Be sure to mention that you’re interested in these Straight Sales in your application and we’ll onboard you quickly. Please Note: Despite the potential for unlimited cap, we cannot guarantee that we will continue to accept affiliates for these Straight Sales. We want to keep everyone who runs these offers to be happy - if you want to ensure you’re one of them, we suggest getting in right away. Disclaimer: Advidi Straight Sales are awesome and very real, but all shocked doctors are fictional. Celebrity affiliates do exist, although they wished to remain anonymous, which we realize defeats the whole point of citing them. Thankfully, these Straight Sales hold up perfectly well without fake social proof, scarcity or artificial authority. If you experience massive profits lasting more than 24 months, please see a doctor (to brag).